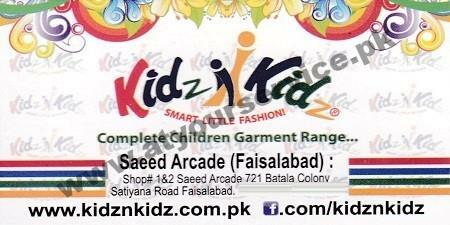 Kidz n Kidz is located in Saeed Arcade, Satyana Road, Batala Colony, Faisalabad. Kidz N Kidz has over 15 years of experience in ‘Kids Clothing & Apparel‘, we are the designer of children garments from the age of New Born to 14 year old, girls & Boys. New Born Clothes, Baby & Baba Suits, Girls Top & T-Shirts, Boys T-Shirts & Shirts, Boys & Girls Bottoms & Pants, Girls Pajama Suits & Shalwar Qameez etc. are all including in our variety of Products.